The wrecks include Royal Navy warship HMS Victory, lost in 1744. The ship went down with Admiral Sir John Balchin, 1,100 sailors and 110 bronze cannon. Wreck Watch has identified ten key sites that they believe warrant further study, mapping, excavation and selective artefact recovery. It said the process would also benefit fishermen, identifying wrecks of non-archaeological value which could be safely fished. The loss of expensive fishing equipment would also be minimised, said their report. 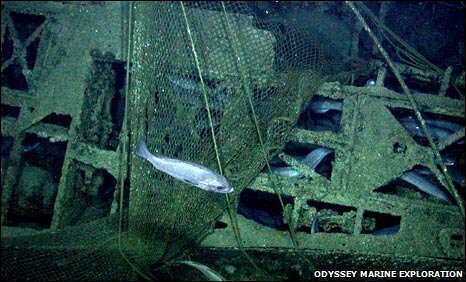 But trawler crews have disputed the claims they are to blame and questions have also been raised by some sceptics because the research was carried out by a US salvage company, which makes money selling sunken treasure. Christopher Vinnicombe, of the Cornish Fish Producers' Organisation, said they tried to avoid the "thousands" of wrecks in the Channel because it often damaged their equipment.